One of the most noteworthy things I covered in yesterday’s massive Understanding Google Panda: Definitive Algo Guide for SEOs was the fact that Panda is now part of Google’s core ranking algo. In other words, it is what many of us call “baked in” the Google core algo, not a spam filter applied after the core did its work. When Panda first launched (and initially known as Farmer, for those who want to go digging through the archives) was a separate spam filter. This meant that it was a filter that was applied to the search results after the core ranking algo as a completely separate piece. But now, Panda is rolled into the core ranking algo. 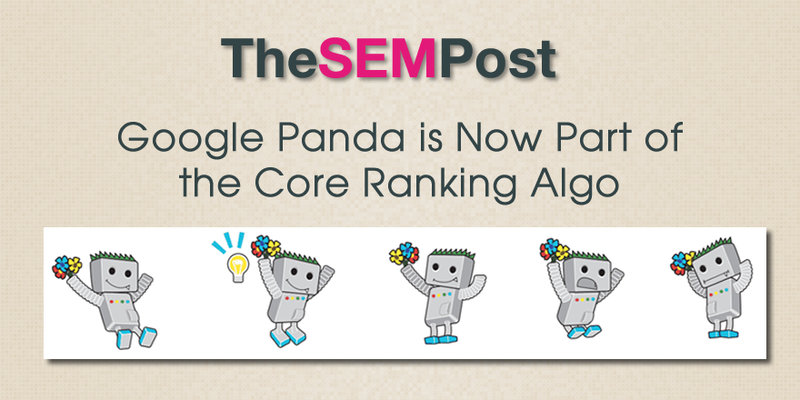 This also means that core ranking algo changes, such as the one we have been seeing over the last few days that Google confirmed is NOT Penguin, could technically be Panda, although we have no confirmation of whether it is or isn’t. But now there is a possibility of any core ranking changes could be connected to Panda. If you haven’t read Understanding Google Panda: Definitive Algo Guide for SEOs, it is worth reading for some very detailed information, along with numerous new quotes directly from Google on just about everything there is to know about Panda. Added: There have been some rumors going around that core algo = real time. Google simply told me it was core, no mention was made to it being real time. John Mueller also confirmed it wasn’t real time in today’s Hangout, and Gary Illyes said the same on Twitter. So in your mind, Jennifer, is there any significance in Panda being part of the core algo for webmasters? Obviously that it’s not a filter makes a difference on Google’s end, but as core =/= real time, this part of the algorithm is likely still reliant on intermittent data updates, which means ultimately a similar (potential for increased frequency aside) experience for webmasters. I never said it was real time, someone jumped to that conclusion and tweeted it, and it went around like wildfire 🙂 Google also confirmed it is not real time. Thank you, Jennifer, for this update. Do you think Google will do the same for Penguin? I mean, make Penguin part of the core? Gone thru your articleon Panda, one thing haunts, if a site have 100 pages, 50 good quality & also in word quantity also, but 50 thin. So thin content 50 pages should be noindexed? If not done, then good 50 will be penalised too? One big issue .. now 400 to 500 word onwards articles are treated good by Google, so to the point short answers or articles are hardly found. Rather articles getting unnecessarily lenghthy just to fulfil Google algo.. its terrific. So it’s part of the core algorithm – but doesn’t mean that it’s working in real-time. Got that. What’s the Does this just mean they are able to refresh Panda more frequently? Jennifer Slegg can we relate this “core algo update” with rank brain or not as Rank Brain is totally machine-learning artificial intelligence system and also the Third most important signals now in Google ranking. So as you mention in your post that “Panda is an algorithm that’s applied to sites overall and has become one of our core ranking signals So my questions is can we relate these two updates together or not. What Google says doesn’t matter, it is write or wrong, because they are neither dependent nor responsible to updates their search engine. They only claim, if you want traffic from us, follow our principles. Google has done a lot of work in advance and implementing and testing for long time and will too. The point is, how much we are following their standards to get search results, what they call search engine optimization basically and which is considered as to be a core ranking algorithm i think. You name it any animal. Rest of tactics and ways are off-page ranking signals, which are about to hit in next step. Any major ranking signal make assigned name, rest are baked in core.